Meier enjoys falafel from West Campus’ newest vegan food truck. On the Map is a series curated by ORANGE to spotlight new or unfamiliar restaurants in the Austin area. Here’s the principle: get a map. With closed eyes, put a finger out and land on a spot. Wherever the finger lands, find the closest unexplored or underrated restaurant, and try it! This time around, ORANGE landed in the nearby student neighborhoods of the University of Texas at Austin, commonly known as West Campus. On the corner of Rio Grande and 26th Street is a food trailer park, fondly named Rancho Rio Eatery. Many trucks and trailers come and go through this little West Campus hangout. The park is currently home to popular trailers such as Longhorn Chicken, Holy Macaroni and Cold Cookie Company. Falafel Joint is one of Rancho Rio’s newest additions. 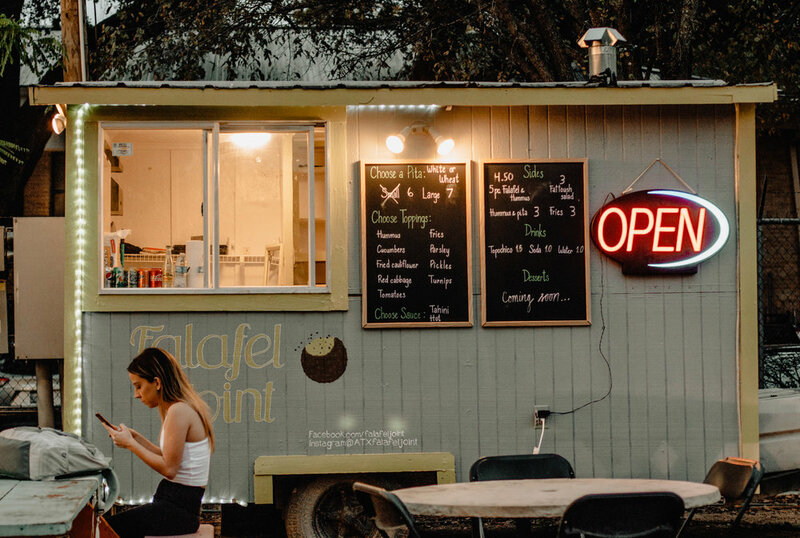 The Falafel Joint food truck is now open in West Campus. Started by Sam Zakzok and Mohamed Abdul, the truck is run by two friends, turned business partners. The falafel truck was flipped from a crepe truck that was originally located in the park. Once painted light purple with a bright green wood trim, ‘Falafel Joint’ is painted in the same bright green, accompanied by a half-eaten cartoon falafel. Local restaurants like Halal Bros and the recently closed Halal Guys brought Middle Eastern flavor to the West Campus area. Falafel Joint is different in the fact that they are completely vegan. The current menu focuses on customizable falafel wraps. Falafel Joint’s falafel is a flat and crispy patty with roasted sesame seeds on top. It is made with juicy chickpeas, various spices and herbs, and an assortment of roasted vegetables. Assembling the wrap is simple. First, choose the pita. Falafel Joints sources their pita from local market Phoenicia Bakery and Deli. It is clear that Falafel Joint carries the “Keep Austin Local” mindset. Options for the pita are white or wheat and small or large. A small is priced at $6, and a large at $7. Two falafel wraps with a side of tahini and hot sauce. There are a variety of toppings that allow for customization, including hummus, french fries, cucumbers, parsley, fried cauliflower, pickles, red cabbage, turnips and tomatoes. Their french fries are a unique added bonus to this Mediterranean dish. The fries are recommended to be tried on the wrap rather than on the side. Lastly, add the sauce. Choose between a mild tahini or hot sauce, or both! Falafel Joint is the perfect location for a midnight snack. It’s prices are affordable for students and there are many sides offered to compliment the meal. Options range from hummus with falafel or pita, fattoush salad, to fries. Grab a friend and take a walk to Falafel Joint. Have a cozy night at Rancho Rio Eatery under the twinkle lights!